The Excalibur 3526TB 5 Tray Dehydrator with Timer Black is a capable machine specially designed to help you enjoy the generous benefits of having healthy and nutritious snacks by drying your fruits and vegetables. This model has classy features which are handy for the consumers. With Excalibur 3526TB Dehydrator you will be able to make some food batches at the same time, which can ultimately help you save your time and money. The 5 Tray Excalibur Dehydrator With 26Hr timer, encompasses the Parallexx design which ensures horizontal air flow with the fan at the rear of the unit, which dries food evenly. The air is distributed evenly across every tray thus eliminating the need for tray rotation. It has Adjustable Thermostat 105◦F to 165◦F. The temperature range is low enough to safeguard active enzymes in fruits and vegetables and is high enough to meet safety standards for dehydrating meat for jerky. Excalibur 352TB Dehydrator is a machine tailored for you needs, its fast and efficient, drying time is reduced as compared to its counterparts due to its efficient heating system. It is a perfect treat for families with small gardens. Though it's a professional-grade machine, still it is very easy to use. 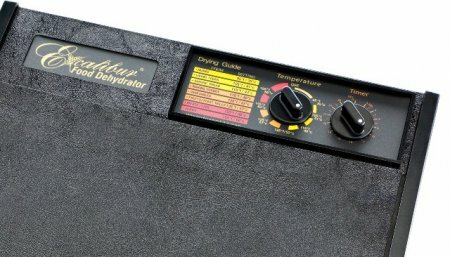 This dehydrator works brilliantly and lives up to its reputation. Excalibur 3526TB Dehydrator is loaded with tremendous features including Hyperwave Fluctuation technology and Parallex Horizontal Airflow. This Excalibur Dehydrator offers reliable performance when drying fruits, vegetables, and meat. The 5 trays provide 8 sq. ft. of dehydrating space which is perfect for a small to medium family. Let’s know about all the outstanding features Excalibur dehydrator possesses in depth. Parallexx technology means that the fan, heating source, and adjustable thermostat are mounted in the rear. Cool air is haggard in the back, heated up, and distributed evenly across each tray. This technology makes Excalibur work perfectly and efficiently. The trays can be removed to accommodate large foods for drying up. In Excalibur dehydrator trays can be adjusted or removed according to the need of the user. It is made up of tough, FDA approved polycarbonate plastic which is BPA free and durable. Excalibur’s dehydrator comes with 5 trays with polycarbonate mesh liners so you can prepare a variety of your favorite fruits, vegetables, and meats with ease. Each tray has a BPA-free poly screen insert, which should be used for drying most foods and is easy to clean with soap and water. As compared to its counterparts in the market the Excalibur 3526TB is designed with a square shape that allows the machine to lock in more heat inside, consequently speeding up the dehydration process and reducing the drying time. The comfortable design of Excalibur Dehydrator lets you leave it alone while it is dehydrating the food. There is no need to open the lid several times to check the progress of food and rotate the trays. The machine makes it sure that the food will be cooked speedily and evenly without you having to supervise it. The Excalibur 3526TB has five trays in total with 8’’ inches of drying space. You can dry large batches of food at the same time. Its large capacity makes this dehydrator ideal for medium to large families or gardeners. With this, you can easily cater to big gatherings or parties. This machine helps you to save time and energy since you do not have to keep on repeating the dehydration process when preparing a meal or dinner for the family. Although this dehydrator has a large capacity for foods, you can be sure that the machine will not take too much space on your kitchen counter. Even if you have limited kitchen size, you can always fit this machine in whatever space you have. In spite of its capacity, the food dehydrator takes very little counter space. The square design of this machine makes it possible to dry the meat and fruit simultaneously. Let's suppose one try contains meat for jerky and another tray has strawberries on it; their smell wouldn't mix with each other. Thanks to its square design which prevents the flavor mixing. Who wouldn't want a gadget for the kitchen which looks stylish and enhances the charm of the kitchen? This machine is designed with an attractive aesthetic that you would love to display on top of the counter. This dehydrator comes with a wide range of temperature settings allowing you to dry any food ranging from fruits to meat for jerky. You can set the temperature between 105 to 165 degrees Fahrenheit. This temperature range enables you to regulate the temperature depending on the food that you are dehydrating. Another great feature this dehydrator has is the 26-hour timer. This function allows you to do other chores or even sleep peacefully at night and set the machine to do its job. When the set time is reached, the machine would be switched off automatically. One of the best things about Excalibur Dehydrator is its heat distribution system. This machine has a horizontal air flow system that makes it possible to distribute heat evenly across every tray. Even heat distribution makes sure that all your food will be cooked at the same time. Unlike many cheap and low-quality dehydrators available in the market, this machine has a perk of on/off switch which is convenient and handy for the users, as it helps get utmost accuracy in the drying process by automatically turning off the machine when the food is ready. If you have fussy kids, then this machine is the solution to your problems. This gadget will make your kids interested in fruits and vegetable without much effort required from you. Excalibur dries up the fruits and vegetables with preserved taste. As the food dries up the tastier and yummier, it gets, perfect treat for your children. Store bought dried food and vegetables are usually brimming with chemicals and toxins hazardous for health. These harmful substances have been shown to lead to numerous health issues such as cancer, high blood pressure, and strokes. Excalibur 3526TB helps you enjoy safe and healthy food whenever you want. The plastic used in this machine is BPA free. BPA is the hazardous material used in cheap plastic products and leads to various health issues. All the trays, mesh trays and body of the dehydrator are made from strong BPA free plastic. Excalibur is one of the leading companies when it comes to these dehydrators. Contemporary dehydrators available in the market are usually made in China. But Excalibur manufactures its appliances in the USA making sure that they are the quality product in every aspect. When you buy Excalibur 5 Tray Dehydrator with Timer, aside from the appliance itself, the box also contains an instruction and recipe booklet that will guide you in operating this machine. Here’s the list of things a user gets when purchasing Excalibur Dehydrator 3526TB. This gadget can accommodate height adjustable 5 trays. Each tray comes with a Polycarbonate mesh liner which is handy when drying up fruits. These poly screen tray inserts stop the food from getting stuck. The package also includes an instruction manual. This helpful book is a complete guide to using your Excalibur Dehydrator. It contains all the details about the product specifications. It also describes in detail how to use the product and how to clean it. Excalibur is always ahead of its counterparts when it comes to customer satisfaction. To make the usage of this appliance easy Excalibur has added a dehydration guide which includes food prep tips as well as a complete 'how to' drying guide for 50 fruits and vegetables plus fruit rolls, jerky, yogurt and more. And the book is entirely illustrated. Excalibur is offering an extended warranty of 10 years, which is quite compelling. The company affirms this product free from defects in material and workmanship for 10 years from the date of purchase. Excalibur is famous company when it comes to the dehydrators specifically. The state-of-the-art technologies and customer satisfaction is their benchmark. Excalibur 3526TB Dehydrator comes with an adjustable thermostat. You'll be able to adjust the temperature between 105F and 165F. A broad temperature range assists you to lower down the temperature to preserve the taste as well as the enzymes in fruit while raising the temperature when making beef jerky perfectly. Excalibur Dehydrator has heavy duty 5” fan, which provides even heating to all the trays. There is a 26-hour digital timer, so you can set the time of drying to your specific preferences. On top of this model is a timer dial that has up to 26 hours of adjustment. You will find that this is such a useful option as it allows you to be busy with other chores, sleeping, or even going out of the house and not to worry about overcooking your food. This dehydrator has 5 trays 15" x 15" each, which are not stackable rather slide back to their place very easily. These trays can be removed to make space for food such as meat. They can be cleaned easily. The material used in the aforementioned dehydrator is BPA free plastic. 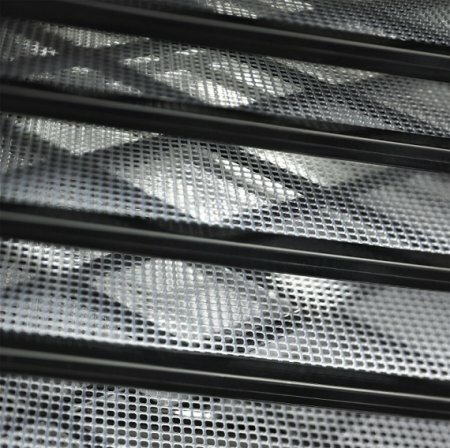 The mesh sheets included are also made from Polycarbonate screens. The weight of this Excalibur machine is 15 pound. The weight of this appliance is not that heavy, so if you want to carry it to place somewhere else, it won't be hectic. The dimension of Excalibur Dehydration is 19 x 17 x 8.5 inches. It is feasible for medium kitchens. One negative about its size is that it is difficult to place in tiny kitchens because it may take a large bit of kitchen counter. 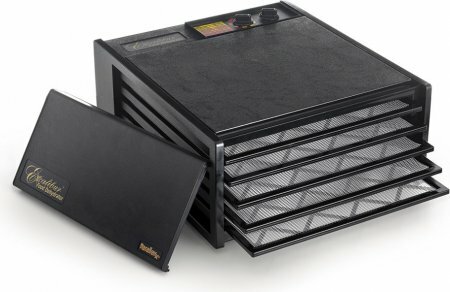 The Excalibur 3526TB dehydrator is black in color. All the exterior of the dehydrator is black which looks stylish and attractive. It is a 400 watts machine, and the voltage it requires is 110-120V. Excalibur initiated the Parallex drying system. Only Excalibur offers the Parallex system, which makes drying even and easy. Excalibur Dehydrator has unique horizontal drying system in the rear of the unit. This system helps in the even dehydration process. Excalibur dehydrator has an automatic on/off switch button. The machine turns off automatically when the food is done, which is convenient for the customer. Every product has some advantages and disadvantages and knowing them help you reach the sound decision regarding the product. Following list is describing the merits of this dehydrator in detail. Excalibur 526TB has large holding capacity which is perfect for a family that loves dried food. It has 8 square feet drying area over 5 trays which are quite good for small to medium size family. Excalibur has an established reputation for manufacturing high quality, top of the line products. The Excalibur dehydrator is much more efficient and faster than its corresponding items in the market, the air moves from the back to the front across all 5 trays. This makes drying process quick and even. Excalibur is a popular company and provides a quality product with remarkable results. This appliance makes healthy, nutritious and delicious food while saving money, which is spent in packaged food with loads and loads of preservatives. The horizontal drying system and the 5” fan are mounted in the rear of the machine to provide efficiently and even drying. Less expensive dehydrators have their heaters on either top or the bottom, which causes flavor mixing, and the difference in temperature between higher and lower trays. This appliance is easy to use which makes it suitable for beginners. You don’t have to worry if you have no experience in handling a dehydrator. Using this machine, you will be able to create homemade dried goods like vegetables, jerky, dried flower petals or even trail mixes whenever you want them with ease. It has a timer which can be adjusted easily according to the required time. It’s such a convenient option that lets you allow doing your work, running an errand or even sleep while it’s working. The outlook of Excalibur 3526 is appealing; its black color looks quite attractive. It is an indulgence for those customers who are concerned about the aesthetics. This machine comes with poly screen trays/liners. The aim of these BPA free mesh liners is to avoid getting the food stuck on the trays. The company has offered an attractive 10 years long warranty for this product. It is a perk up for the buyers and a statement for customer's satisfaction. Excalibur is the pioneer company in providing small horizontal dehydrators. Previously, horizontal air flow technology was only used in large dehydrators. In this dehydrator door and trays can be removed for convenient loading of the food and cleaning of the machine, or to expand drying compartment. Polycarbonate mesh liners make it easy to clean the trays, adding more to convenience the trays are dishwasher safe. With loads of advantages Excalibur Dehydrator has a few demerits as well; let’s have a look at them. One setback of this machine is its price. It may be a bit expensive especially for those who have a restricted budget. But you can certainly expect excellent and high-quality features that will give you your money’s worth. Excalibur 3526TB is a high-end, powerful model and its heavy duty fan produces some noise. A lot of noise is produced due to the fan that pushes the hot air evenly amongst trays for the perfect dehydration. The fan runs continuously and may concern people who are noise sensitive or sit around the device for long. Those with limited kitchen space might have a hard time finding room to operate and store this. Still, it can be fitted on large countertops, but that would be a hassle. The number of trays is 5 and cannot be increased even when required. That means it is not suitable to cater the need of a large family. The trays of this appliance can break easily. Therefore they must be used and handle with care. This dehydrator is comparatively smaller in size and feasible for small families. Consumers whose requirement is large food capacity dehydrator for their big family should think twice before making a decision. Following is the list of videos links containing reviews of Excalibur 3526TB. These videos are going to help you get familiar with the product very well. Q: How Loud Is This Dehydrator's Sound? Does It Affect the Normal Activities? Well, it's not very loud, but for those people who are concerned with even a bit of noise may get disturbed with its constant humming. Q: What Should Be the Size of Paraflexx Sheets for This Dehydrator’s Trays? You should buy the sheets of 14" x 14" size, which fits great. Q: the Plastic Used in This Dehydrator Is BPA Free? Yes, all the trays are made from polycarbonate BPA free plastic. Q: What Is the Wattage of the 3529TB Model? It is a 400 watts product, which makes it quite energy efficient appliance. Q: Is It True, That Excalibur Is Offering a 10-year Warranty for This Machine? Yes, it’s true. Excalibur is offering a 10-year warranty, and you don't have to buy it separately. Q: Do We Get Any Recipe Book or Any such Thing with Excalibur 3526TB Model? Yes, you will get A Guide to Dehydration, preserve it naturally and an instruction manual. Q: Can We Dry Meat in This Dehydrator for Jerky? Oh yes! Excalibur is famous for beef jerky, as the temperature settings are feasible for making jerky. And let me tell you, the results are outstanding. Q: Can I Use This Excalibur Dehydrator in Any Country Other Than the US? This dehydrator is specifically wired for the US. So if you want to use it in any other country, you can always get a converter. Q: Is It Necessary to Use Drying Sheets in This Dehydrator? It’s better to use the sheets while drying the food. Especially for Juicy and squishy foods because these foods can spoil the trays and would make the cleaning process way too difficult. Using the sheets is tidy and handy as well. Q: What Is the Length of the Electrical Cord of 3526TB Dehydrator? The length of the chord is 36" long. Which is super duper handy. Even if the appliance is placed somewhere far away from the switch, it's easy to connect it. Q: When We Dry Something in the Machine Does It Smell Like Plastic, or Does the Food Get the Smell of Plastic? No the only smell coming from the dehydrator is of food which is also very mild and tasty. It doesn't give plastic smell at all. Q: What Is the Material of Plates in This Dehydrator? Are They Steel or Plastic? The trays are made from plastic, not steel. They are easy to clean and better than steel trays. Q: Does the Machine Go Off When Automatically When the Timer Turns Off? Yes, the dehydrator turns off automatically when the time is over. Q: Does the Appliance Have Built in Timer? Yes, the appliance has a built-in timer, and customers usually prefer this machine because of the timer. Q: How Much Difficult It Is to Wash the Trays When It Has Food Drip During the Drying Process? The trays and liners can be washed easily in the dishwasher or by hands. Q: Does Your Electricity Bill Hike Up after Using This Dehydrator? No, this dehydrator doesn't affect your bill negatively. It is an energy efficient appliance and thus consumes less electricity. 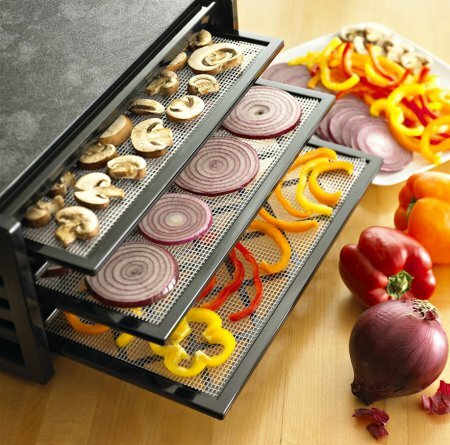 Q: Does This Dehydrator Make Vegetable or Chips Crispy? Yes, the chips are super crispy. Q: Where Is the Fan Located? The fan is located at the back of machines; this helps in even drying of food. Q: Can I Get to Know About the Dimension of This Dehydrator? 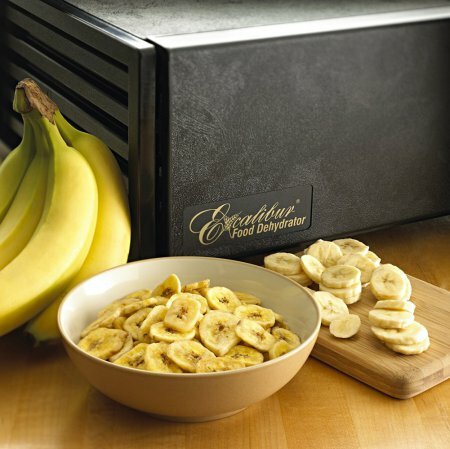 The dimension of Excalibur Dehydrator is 8½" x 17"W x 19" D.
Q: Can We Make Crispy Banana Chips with This Dehydrator, as My Current Dehydrator Is Making It Chewy? Yes, it makes the banana chips crispy and tasty. The Excalibur 3526TB Dehydrator is a high-end state-of-the-art model that has the whole thing; you'll ever want in a food dehydrator. From a built-in timer to a wide range of temperature controls and even dehydration it encompasses everything. The Excalibur 3526TB is the finest investment in the long term which saves your money and provides healthy food alternatives. It has exceptional features that will certainly help you enjoy the benefits of food dehydration. It is advertized as the appliance for families with a small garden. If you love dried foods, you’ll love the 3526TB. This dehydrator is a quality machine that includes the most important features for optimal results. We are so much used to eating packaged foods, and there is a need to switch to healthier options. And Excalibur is the answer to the need. Excalibur-3526TW comes with a flexible BPA-free poly-screen insert that which be used to drying most of the foods. The trays are easy to clean with Soap and Water. The machine includes all great features which will provide you the benefits of food dehydration.